After sight-seeing the Taj Mahal in Agra and the Sabarmati Ashram in Ahmedabad, Canadian Prime Minister Justin Trudeau got down to work in Mumbai. He, along with his wife Sophie Gregoire Trudeau and three kids -- daughter Ella Grace and sons Hadrien and Xavier – arrived in the country’s financial capital on Monday night. Here are snapshots from Day 3 of their visit. 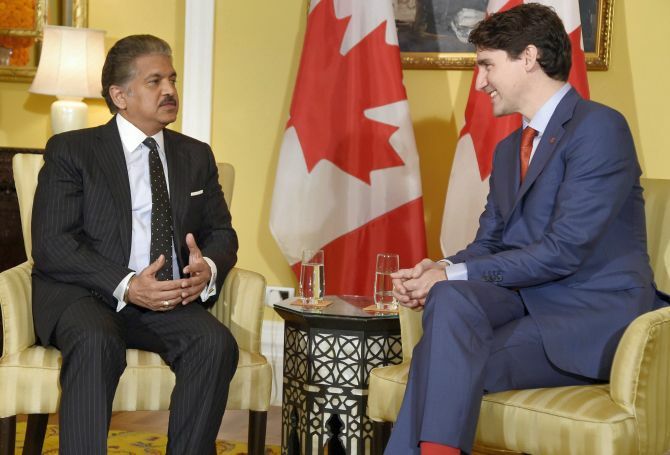 Canadian Prime Minister Justin Trudeau interacts with Mahindra chairman Anand Mahindra. According to reports, the Canadian PM met with six of India’s most influential business tycoons making deals that he says will create at least 5,000 new jobs in Canada. 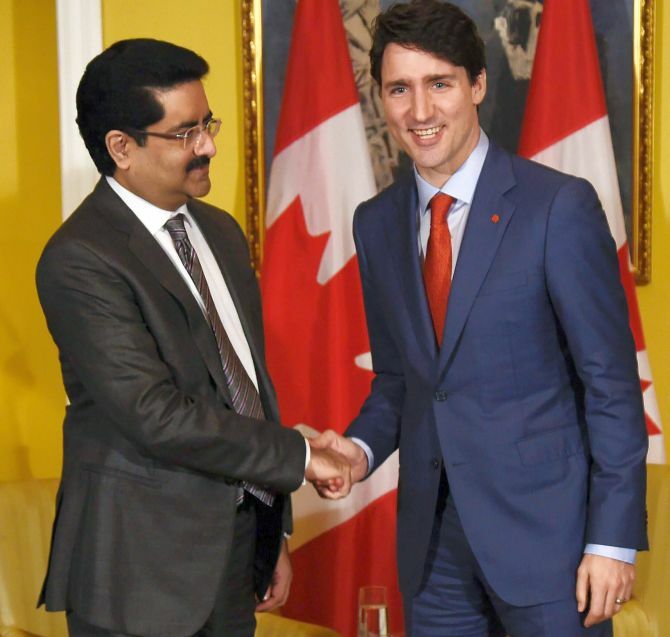 Kumarmangalam Birla, the chairman of Indian conglomerate Aditya Birla Group and the country’s eighth wealthiest person, in his meeting with Trudeau said the business friendliness of the federal and provincial governments in Canada makes for happy investors who will always come back looking for more. 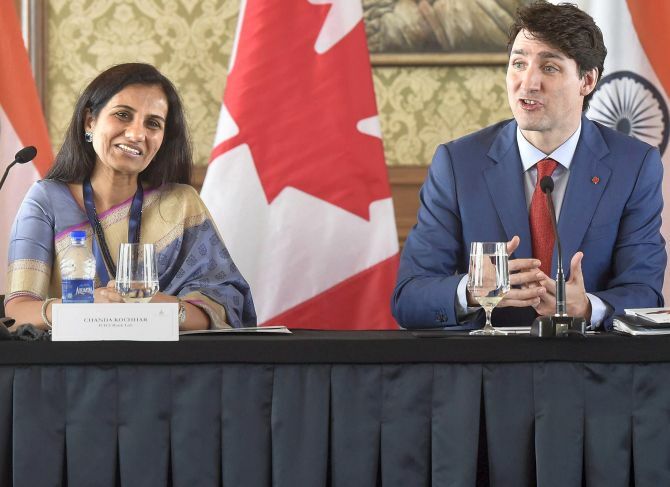 MD and CEO ICICI Bank, Chanda Kochhar hosted the dialogue with Trudeau at the India-Canada business forum in Mumbai. “It was a win-win day for all of us. I’m excited about the opportunities in the India-Canada friendship. There are not just business but cultural and people-to-people ties that are important,” he added. And while Justin Trudeau was all work, his wife Sophie Gregoire Trudeau visited Sophia College in south Mumbai. The Canadian First Lady held discussions on domestic and gender-based violence. During her interaction, she said that all sections of the society should “stand up together” to eliminate gender disparity from the world. The fight for eliminating inequality does not mean pitting one gender against the other, Sophie Gregoire Trudeau said, adding “rather men are our allies.” Trudeau, a mother of three, said education is the key to ending gender inequality. 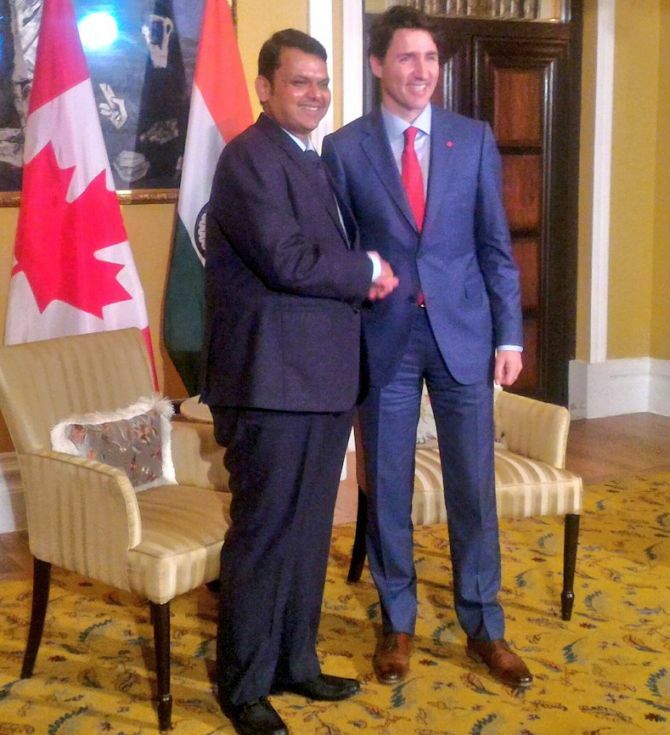 Canadian PM Trudeau also met Maharashtra’s Chief Minister Devendra Fadnavis. 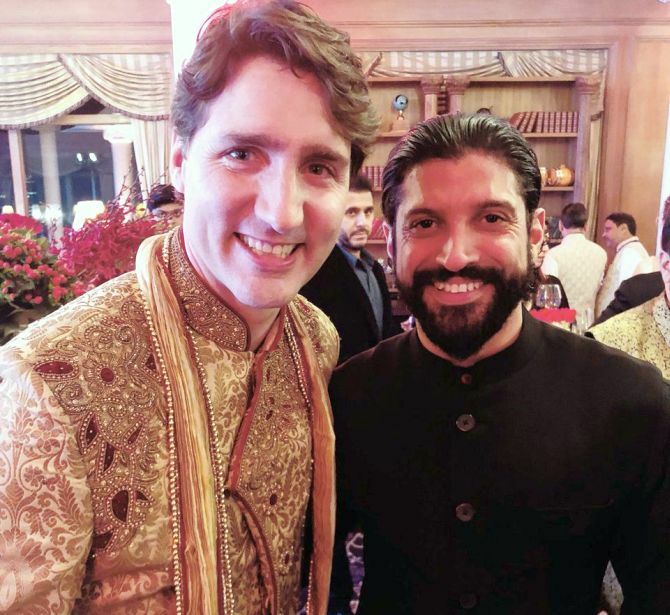 It is learnt that while in the city, Trudeau will also be meeting Bollywood stars. After a hard day’s work, the Canadian PM Justin Trudeau and his wife Sophie Gregoire Trudeau along with two of their three kids enjoyed some down time with Bollywood celebrities. 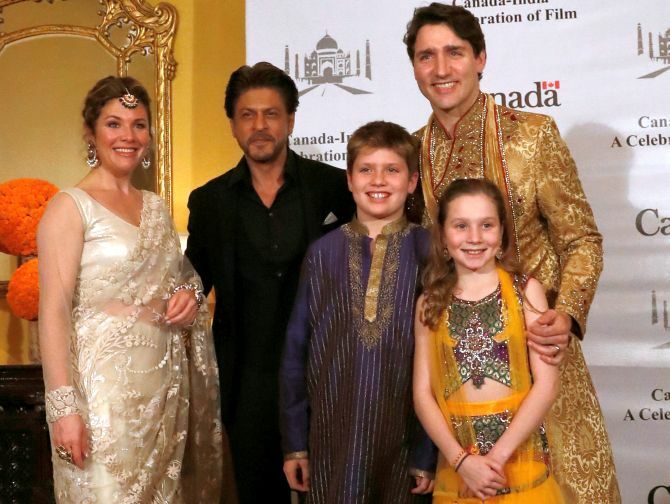 Trudeaus were introduced to the ‘King of Romance’ Shah Rukh Khan at the event. 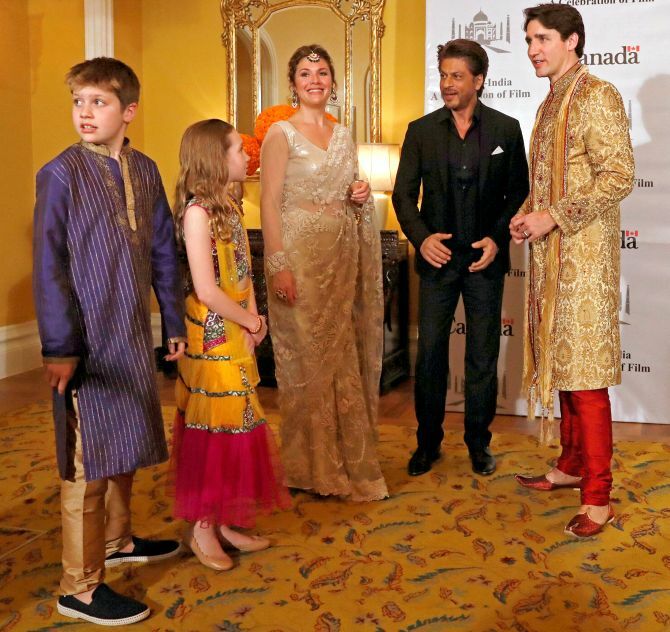 While meeting Shah Rukh and the other stars, the Trudeaus opted for a desi look again – they went desi during their Gujarat leg of the trip too. The Canadian PM wore an intricate golden sherwani while Sophie Gregoire Trudeau draped a beautiful off-white sari. It wasn't only Shah Rukh that the Canadian PM rubbed shoulders with. 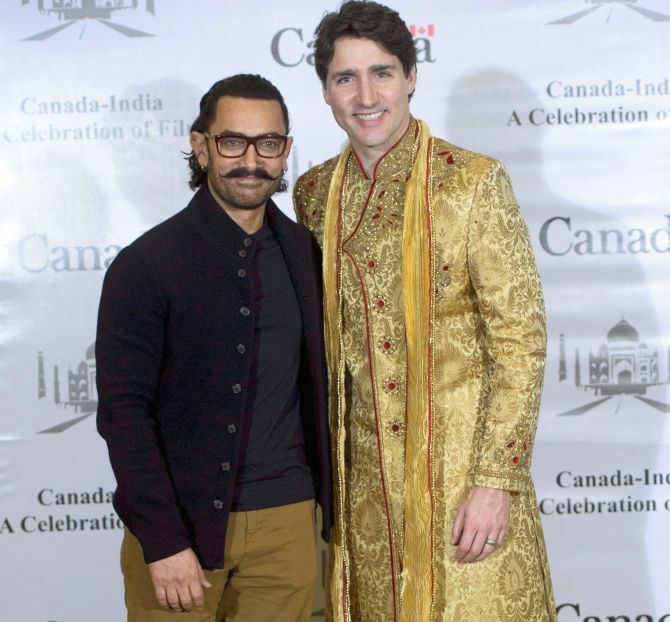 At the event, Trudeau was all smiles as he chatted up Aamir Khan. Farhan Akhtar posted this image, writing, "Was an honour & a pleasure to meet the Hon. Prime Minister of Canada, @JustinTrudeau & his lovely wife, Sophie. Sir, your leadership in the discourse for ending gender discrimination serves as constant inspiration to us all." PHOTOS: Justin Trudeau's son joining him at work is oh-so-cute!